So, in case you haven’t noticed, the poke bowl obsession (pronounced poh-KAY… for any amateurs out there) has swept the continental United States food scene. As a Hawaii-born chick, I’m crazy happy about it – although, it’s somewhat annoying in a weird way. I remember growing up in the suburbs of Washington State with kids making fun of me for liking raw fish and other Pacific Island foods. But now, because it’s “trendy,” everyone’s all about their poke bowls. (Enter cultural appropriation – but I digress… I’ll write something more in dept about that later). 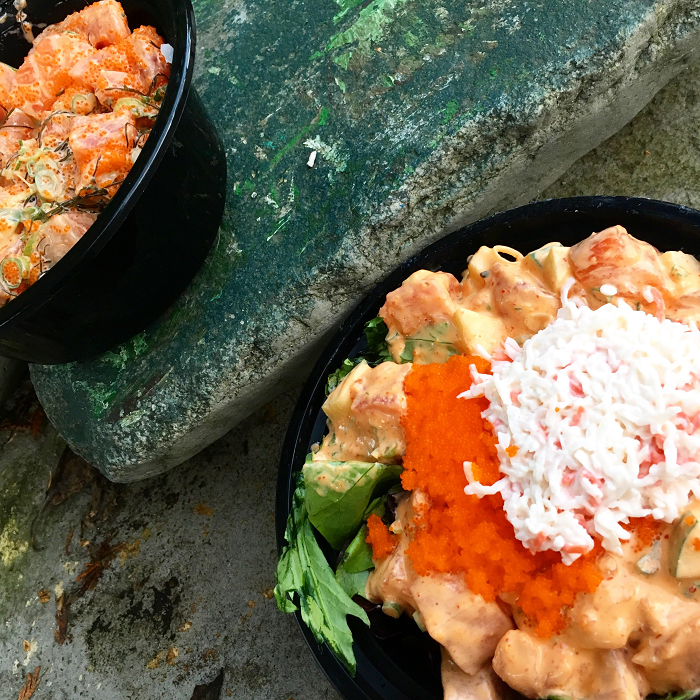 Bottom line: Poke bowls are bomb.com. And if you have yet to enjoy the amazingness of this island-style combination, here’s a little breakdown for you. 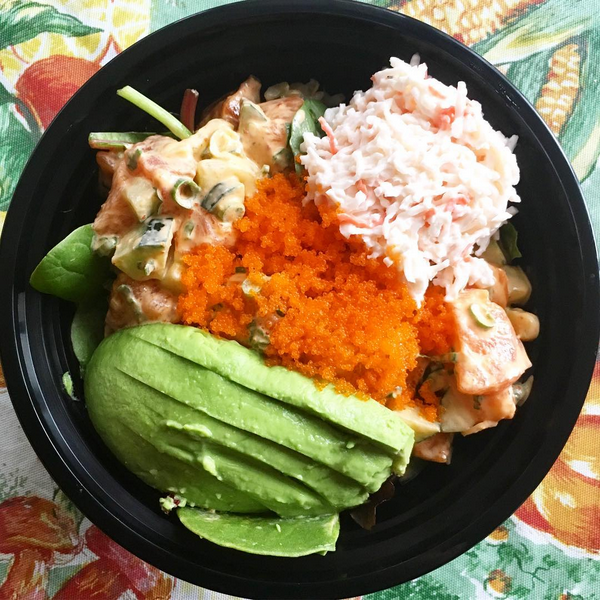 Poke is something islanders have been eating for generations. It’s nothing new. And now that it’s being served in in a convenient bowl (who doesn’t love sh*t in a cute little bowl? ), everyone’s sourcing out their nearest poke bowl spot, and taking Instagram photos of their food as if it’s a passport to trendy town. Yeah, I totally took delicious looking poke bowl photos too. But for me, it was more because a favorite food from my childhood was FINALLY available commercially… at the age of 30. Sorry, I’m starting to veer into that “cultural appropriation” lane again. Stop it. Traditionally, poke consists of fresh ahi tuna, soy sauce, sesame oil, green onion, and whatever other accoutrements were available (like seaweed or fish roe). It really is the perfect blend of salty, meaty, nutty, and umami. And it’s basically a raw sushi roll without the excess. New York City has countless poke bowl restaurants available in Midtown Manhattan now, such as Koshe Poke, Pokeworks, and The PokeSpot. And you know what? They’re perfectly fine. But they miss that… I don’t know… “island flavor?” I can’t explain it. Maybe commercialism ruins the taste of the dish. So far, my favorite poke bowl spot is Poke MIX – a small popup in Bellevue Square, Washington. I may prefer the East Coast, living-wise, but I really can’t deny it – when it comes to Hawaiian food on the mainland, the West Coast is effin’ KING. Not only is this place generous with their portion sizes (a small poke bowl is NOT acceptable), but the guy behind the counter when I visited was actually a fellow Poly boy who said “Mele Kalikimaka” last December. I felt like I was home, and that’s good enough for me. Feel free to customize your poke bowl however you want, but seriously – if you ever order a poke bowl with chicken or tofu, never speak to me again. The whole point of the poke bowl is the POKE. Embrace Mother Nature and appreciate the amazingness of fresh ocean catches.